Diazepam, first marketed as Valium, is a medication of the health system. Dosages should be determined on an individual basis, depending upon the condition being treated, severity of symptoms, patient body weight, and any other conditions the person may have. The anticonvulsant effects of diazepam can help in the treatment of seizures due to a drug overdose or chemical toxicity as a result of exposure to lindane, chloroquine, physostigmine, or pyrethroids. Elderly and very ill patients may possibly suffer apnea and/or cardiac arrest. Concomitant use of other central nervous system depressants increases this risk. The smallest possible effective dose should be used for this group of patients. The elderly metabolise benzodiazepines much more slowly than younger adults, and are also more sensitive to the effects of benzodiazepines even at similar blood plasma levels. Doses of diazepam are recommended to be about half of those given to younger people, and treatment limited to a maximum of two weeks. Long-acting benzodiazepines such as diazepam are not recommended for the elderly. Diazepam may also be dangerous in geriatric patients owing to a significant increased risk of falls. Benzodiazepine treatment should be discontinued as soon as possible by a slow and gradual dose reduction regimen. Tolerance develops to the therapeutic effects of benzodiazepines; for example tolerance occurs to the anticonvulsant effects and as a result benzodiazepines are not generally recommended for the long-term management of epilepsy. Dose increases may overcome the effects of tolerance, but tolerance may then develop to the higher dose and adverse effects may increase. The mechanism of tolerance to benzodiazepines includes uncoupling of receptor sites, alterations in gene expression, down-regulation of receptor sites, and desensitisation of receptor sites to the effect of GABA. About one-third of individuals who take benzodiazepines for longer than four weeks become dependent and experience a withdrawal syndrome upon cessation. Patients from the aforementioned groups should be monitored very closely during therapy for signs of abuse and development of dependence. Therapy should be discontinued if any of these signs are noted, although if physical dependence has developed, therapy must still be discontinued gradually to avoid severe withdrawal symptoms. Long-term therapy in these people is not recommended. People suspected of being physiologically dependent on benzodiazepine drugs should be very gradually tapered off the drug. Withdrawals can be life-threatening, particularly when excessive doses have been taken for extended periods of time. Equal prudence should be used whether dependence has occurred in therapeutic or recreational contexts. The oral LD50 (lethal dose in 50% of the population) of diazepam is 720 mg/kg in mice and 1240 mg/kg in rats. D. J. Greenblatt and colleagues reported in 1978 on two patients who had taken 500 and 2000 mg of diazepam, respectively, went into moderately deep comas, and were discharged within 48 hours without having experienced any important complications, in spite of having high concentrations of diazepam and its metabolites esmethyldiazepam, oxazepam, and temazepam, according to samples taken in the hospital and as follow-up. Diazepam can be administered orally, intravenously (needs to be diluted, as it is painful and damaging to veins), intramuscularly (IM), or as a suppository. One of the more straightforward approaches to this compound involves first the acetylation of aminobenzophenone () with chloroacetyl chloride to give the chloromethyl amide (). Heating this compound with ammonia or its latent equivalent, hexamethylene tetramine (HMTA), can be envisaged to involve the initial displacement of chlorine to give a glycineamide. Cyclization by imine formation then affords diazepam. Support for this sequence comes from the observation that a modest yield of diazepam can be obtained on heating (1) with glycine ethyl ester in pyridine. The second way consists of the direct cyclocondensation of 2-amino-5-chlorobenzophenone with glycine ethyl ester hydrochloride. The amide nitrogen atom of the obtained 7-chloro-1,3-dihydro-5-phenyl-2H-1,4-benzodiazepin-2-one, is methylated by dimethylsulfate, which leads to the formation of diazepam. The first method differs from the second in that the methylation of nitrogen is accomplished before the cyclocondensation reaction. To do this, the initial 2-amino-5-chlorobenzophenone is first tosylated by p-toluenesulfonylchloride and the obtained tosylate transformed into the N-sodium salt, which is then alkylated by dimethylsulfate. The resulting 2-N-tosyl-N-methyl-5-chlorobenzophenone is hydrolyzed in an acidic medium, giving 2-methylamino-5-chlorobenzophenone, which undergoes cyclocondensation by reaction with ethyl ester of glycine hydrochloride, forming the desired diazepam. 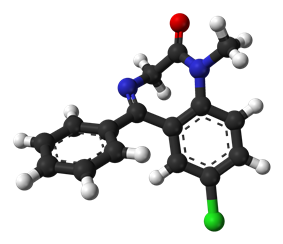 The benzodiazepines gained popularity among medical professionals as an improvement upon barbiturates, which have a comparatively narrow therapeutic index, and are far more sedative at therapeutic doses. The benzodiazepines are also far less dangerous; death rarely results from diazepam overdose, except in cases where it is consumed with large amounts of other depressants (such as alcohol or opioids). Benzodiazepine drugs such as diazepam initially had widespread public support, but with time the view changed to one of growing criticism and calls for restrictions on their prescription. A large-scale study in the US, conducted by SAMHSA, using data from 2011, determined benzodiazepines were present in 28.7% of emergency department visits involving nonmedical use of pharmaceuticals. In this regard, benzodiazepines are second only to opiates which were detected in 39.2% of visits. About 29.3% of drug-related suicide attempts involve benzodiazepines, making them the most frequently represented class in drug-related suicide attempts. Males abuse benzodiazepines as commonly as females. ^ Clinical Addiction Psychiatry. Cambridge University Press. 2010. p. 156. ^ Ries, Richard K. (2009). Principles of addiction medicine. (4 ed.). Philadelphia: Wolters Kluwer/Lippincott Williams & Wilkins. p. 106. ^ a b c d e Calcaterra, NE; Barrow, JC (16 April 2014). 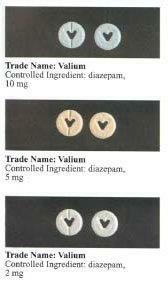 "Classics in chemical neuroscience: diazepam (valium).". ACS chemical neuroscience 5 (4): 253–60. ^ a b c d e f "Diazepam". The American Society of Health-System Pharmacists. Retrieved Jun 5,15. ^ Ogle, guest editors, Harry Dym, Orrett E. (2012). Oral surgery for the general dentist. Philadelphia: Saunders. p. 8. ^ a b c d e f g h i j k l m n o p q r s t Riss J, Cloyd J, Gates J, Collins S (August 2008). "Benzodiazepines in epilepsy: pharmacology and pharmacokinetics". Acta Neurologica Scandinavica 118 (2): 69–86. ^ Perkin, Ronald M. (2008). Pediatric hospital medicine : textbook of inpatient management (2nd ed.). Philadelphia: Wolters Kluwer Health/Lippincott Williams & Wilkins. p. 862. ^ Bråthen G, Ben-Menachem E, Brodtkorb E, Galvin R, Garcia-Monco JC, Halasz P, Hillbom M, Leone MA, Young AB (August 2005). "EFNS guideline on the diagnosis and management of alcohol-related seizures: report of an EFNS task force". European Journal of Neurology : The Official Journal of the European Federation of Neurological Societies 12 (8): 575–81. ^ Cesarani A, Alpini D, Monti B, Raponi G (March 2004). "The treatment of acute vertigo". Neurological Sciences : Official Journal of the Italian Neurological Society and of the Italian Society of Clinical Neurophysiology. 25 Suppl 1: S26–30. ^ Lader M, Tylee A, Donoghue J (2009). "Withdrawing benzodiazepines in primary care". CNS Drugs 23 (1): 19–34. ^ Okoromah CN, Lesi FE (2004). Okoromah, Christy AN, ed. "Diazepam for treating tetanus". The Cochrane Database of Systematic Reviews (1): CD003954. ^ Kindwall, Eric P.; Whelan, Harry T. (1999). Hyperbaric Medicine Practice (2nd ed.). Best Publishing Company. ^ Walker M (September 2005). "Status epilepticus: an evidence based guide". BMJ (Clinical Research Ed.) 331 (7518): 673–7. ^ Prasad K, Al-Roomi K, Krishnan PR, Sequeira R (2005). "Anticonvulsant therapy for status epilepticus". The Cochrane Database of Systematic Reviews (4): CD003723. ^ Isojärvi JI, Tokola RA (December 1998). "Benzodiazepines in the treatment of epilepsy in people with intellectual disability". Journal of Intellectual Disability Research : JIDR. 42 Suppl 1: 80–92. ^ Bajgar J (2004). "Organophosphates/nerve agent poisoning: mechanism of action, diagnosis, prophylaxis, and treatment". Advances in Clinical Chemistry. Advances in Clinical Chemistry 38: 151–216. ^ Offringa, M; Newton, R (18 April 2012). "Prophylactic drug management for febrile seizures in children.". The Cochrane database of systematic reviews 4: CD003031. ^ Kaplan PW (November 2004). "Neurologic aspects of eclampsia". Neurologic Clinics 22 (4): 841–61. ^ Duley L (February 2005). "Evidence and practice: the magnesium sulphate story". Best Practice & Research. Clinical Obstetrics & Gynaecology 19 (1): 57–74. ^ Zeilhofer HU, Witschi R, Hösl K (May 2009). "Subtype-selective GABAA receptor mimetics—novel antihyperalgesic agents?". Journal of Molecular Medicine (Berlin, Germany) 87 (5): 465–9. ^ Mezaki T, Hayashi A, Nakase H, Hasegawa K (September 2005). "[Therapy of dystonia in Japan]". Rinshō Shinkeigaku = Clinical Neurology (in Japanese) 45 (9): 634–42. ^ Kachi T (December 2001). "[Medical treatment of dystonia]". Rinshō Shinkeigaku = Clinical Neurology (in Japanese) 41 (12): 1181–2. ^ Ashton H (2005). "The diagnosis and management of benzodiazepine dependence" (PDF). Current Opinion in Psychiatry 18 (3): 249–55. ^ Mañon-Espaillat R, Mandel S (1999). "Diagnostic algorithms for neuromuscular diseases". Clinics in Podiatric Medicine and Surgery 16 (1): 67–79. ^ Authier N, Balayssac D, Sautereau M, Zangarelli A, Courty P, Somogyi AA, Vennat B, Llorca PM, Eschalier A (November 2009). "Benzodiazepine dependence: focus on withdrawal syndrome". Annales Pharmaceutiques Françaises 67 (6): 408–13. ^ Shats V, Kozacov S (June 1995). "[Falls in the geriatric department: responsibility of the care-giver and the hospital]". Harefuah (in Hebrew) 128 (11): 690–3, 743. ^ Kanto JH (May 1982). "Use of benzodiazepines during pregnancy, labour and lactation, with particular reference to pharmacokinetic considerations". Drugs 23 (5): 354–80. ^ McElhatton PR (1994). "The effects of benzodiazepine use during pregnancy and lactation". Reproductive Toxicology (Elmsford, N.Y.) 8 (6): 461–75. ^ Yudofsky SC, Hales RE (1 December 2007). The American Psychiatric Publishing Textbook of Neuropsychiatry and Behavioral Neurosciences, Fifth Edition (American Psychiatric Press Textbook of Neuropsychiatry). US: American Psychiatric Publishing, Inc. pp. 583–584. ^ Whiting PJ (February 2006). "GABA-A receptors: a viable target for novel anxiolytics?". Current Opinion in Pharmacology 6 (1): 24–9. ^ Kay DW, Fahy T, Garside RF (December 1970). "A seven-month double-blind trial of amitriptyline and diazepam in ECT-treated depressed patients". The British Journal of Psychiatry : The Journal of Mental Science 117 (541): 667–71. ^ Marrosu F, Marrosu G, Rachel MG, Biggio G (1987). "Paradoxical reactions elicited by diazepam in children with classic autism". Functional Neurology 2 (3): 355–61. ^ Michel L, Lang JP (2003). "[Benzodiazepines and forensic aspects]". L'Encéphale (in French) 29 (6): 479–85. ^ Berman ME, Jones GD, McCloskey MS (February 2005). "The effects of diazepam on human self-aggressive behavior". Psychopharmacology 178 (1): 100–6. ^ Pérez Trullen JM, Modrego Pardo PJ, Vázquez André M, López Lozano JJ (1992). "Bromazepam-induced dystonia". Biomedicine & Pharmacotherapy = Biomédecine & Pharmacothérapie 46 (8): 375–6. ^ Hriscu A, Gherase F, Năstasă V, Hriscu E (October–December 2002). "[An experimental study of tolerance to benzodiazepines]". Revista Medico-Chirurgicală̆ a Societă̆ţ̜ii De Medici ş̧i Naturaliş̧ti Din Iaş̧i 106 (4): 806–811. ^ Kozená L, Frantik E, Horváth M (May 1995). "Vigilance impairment after a single dose of benzodiazepines". Psychopharmacology 119 (1): 39–45. ^ MacKinnon GL, Parker WA (1982). "Benzodiazepine withdrawal syndrome: a literature review and evaluation". The American Journal of Drug and Alcohol Abuse 9 (1): 19–33. ^ Onyett SR (April 1989). "The benzodiazepine withdrawal syndrome and its management". The Journal of the Royal College of General Practitioners 39 (321): 160–3. ^ Chouinard G, Labonte A, Fontaine R, Annable L (1983). "New concepts in benzodiazepine therapy: rebound anxiety and new indications for the more potent benzodiazepines". Progress in Neuro-Psychopharmacology & Biological Psychiatry 7 (4–6): 669–73. ^ Lader M (December 1987). "Long-term anxiolytic therapy: the issue of drug withdrawal". The Journal of Clinical Psychiatry 48: 12–6. ^ Murphy SM, Owen R, Tyrer P (1989). "Comparative assessment of efficacy and withdrawal symptoms after 6 and 12 weeks' treatment with diazepam or buspirone". The British Journal of Psychiatry : The Journal of Mental Science 154 (4): 529–34. ^ Loiseau P (1983). "[Benzodiazepines in the treatment of epilepsy]". L'Encéphale 9 (4 Suppl 2): 287B–292B. ^ Poulos CX, Zack M (November 2004). "Low-dose diazepam primes motivation for alcohol and alcohol-related semantic networks in problem drinkers". Behavioural Pharmacology 15 (7): 503–12. ^ Vorma H, Naukkarinen HH, Sarna SJ, Kuoppasalmi KI (2005). "Predictors of benzodiazepine discontinuation in subjects manifesting complicated dependence". Substance Use & Misuse 40 (4): 499–510. ^ a b c Barondes SH (2003). Better Than Prozac. New York: Oxford University Press. pp. 47–59. ^ Greenblatt DJ, Woo E, Allen MD, Orsulak PJ, Shader RI (October 1978). "Rapid recovery from massive diazepam overdose". JAMA : The Journal of the American Medical Association 240 (17): 1872–4. ^ Lai SH, Yao YJ, Lo DS (October 2006). "A survey of buprenorphine related deaths in Singapore". Forensic Science International 162 (1–3): 80–6. ^ a b c d Holt, Gary A. (1998). Food and Drug Interactions: A Guide for Consumers. Chicago: Precept Press. pp. 90–91. ^ Zácková P, Kvĕtina J, Nĕmec J, Nĕmcová J (December 1982). "Cardiovascular effects of diazepam and nitrazepam in combination with ethanol". Die Pharmazie 37 (12): 853–6. ^ Back DJ, Orme ML (June 1990). "Pharmacokinetic drug interactions with oral contraceptives". Clinical Pharmacokinetics 18 (6): 472–84. ^ Bendarzewska-Nawrocka B, Pietruszewska E, Stepień L, Bidziński J, Bacia T (January–February 1980). "[Relationship between blood serum luminal and diphenylhydantoin level and the results of treatment and other clinical data in drug-resistant epilepsy]". Neurologia I Neurochirurgia Polska 14 (1): 39–45. ^ Bateman DN (1986). "The action of cisapride on gastric emptying and the pharmacodynamics and pharmacokinetics of oral diazepam". European Journal of Clinical Pharmacology 30 (2): 205–8. ^ Mattila MJ, Nuotto E (1983). "Caffeine and theophylline counteract diazepam effects in man". Medical Biology 61 (6): 337–43. ^ "Possible Interactions with: Valerian". ^ Braestrup C, Squires RF (1 April 1978). "Pharmacological characterization of benzodiazepine receptors in the brain". European Journal of Pharmacology 48 (3): 263–70. ^ Chweh AY, Swinyard EA, Wolf HH, Kupferberg HJ (February 25, 1985). "Effect of GABA agonists on the neurotoxicity and anticonvulsant activity of benzodiazepines". Life Sciences 36 (8): 737–44. ^ Battistin L, Varotto M, Berlese G, Roman G (February 1984). "Effects of some anticonvulsant drugs on brain GABA level and GAD and GABA-T activities". Neurochemical Research 9 (2): 225–31. ^ Taft WC, DeLorenzo RJ (May 1984). "Micromolar-affinity benzodiazepine receptors regulate voltage-sensitive calcium channels in nerve terminal preparations" (PDF). Proceedings of the National Academy of Sciences of the United States of America (PDF) 81 (10): 3118–22. ^ Miller JA, Richter JA (January 1985). "Effects of anticonvulsants in vivo on high affinity choline uptake in vitro in mouse hippocampal synaptosomes". British Journal of Pharmacology 84 (1): 19–25. ^ Gallager DW, Mallorga P, Oertel W, Henneberry R, Tallman J (February 1981). "[3H]Diazepam binding in mammalian central nervous system: a pharmacological characterization". The Journal of Neuroscience : The Official Journal of the Society for Neuroscience 1 (2): 218–25. ^ Oishi R, Nishibori M, Itoh Y, Saeki K (May 27, 1986). "Diazepam-induced decrease in histamine turnover in mouse brain". European Journal of Pharmacology 124 (3): 337–42. ^ Grandison L (1982). "Suppression of prolactin secretion by benzodiazepines in vivo". Neuroendocrinology 34 (5): 369–73. ^ Tan, Kelly R.; Rudolph, Uwe; Lüscher, Christian (2011). receptor subtypes and addiction"A"Hooked on benzodiazepines: GABA (PDF). ^ Zakusov VV, Ostrovskaya RU, Kozhechkin SN, Markovich VV, Molodavkin GM, Voronina TA (October 1977). "Further evidence for GABA-ergic mechanisms in the action of benzodiazepines". Archives Internationales De Pharmacodynamie Et De Thérapie 229 (2): 313–26. ^ McLean MJ, Macdonald RL (February 1988). "Benzodiazepines, but not beta carbolines, limit high frequency repetitive firing of action potentials of spinal cord neurons in cell culture". The Journal of Pharmacology and Experimental Therapeutics 244 (2): 789–95. ^ Date SK, Hemavathi KG, Gulati OD (November 1984). "Investigation of the muscle relaxant activity of nitrazepam". Archives Internationales De Pharmacodynamie Et De Thérapie 272 (1): 129–39. ^ Olive G, Dreux C (January 1977). "Pharmacologic bases of use of benzodiazepines in peréinatal medicine". Archives Françaises De Pédiatrie 34 (1): 74–89. ^ Vozeh S (November 21, 1981). "[Pharmacokinetic of benzodiazepines in old age]". Schweizerische Medizinische Wochenschrift 111 (47): 1789–93. ^ BlažEvić, N.; Kajfež, F. (1970). "A new ring closure of 1,4-benzodiazepine". Journal of Heterocyclic Chemistry 7 (5): 1173. ^ Sternbach, L. H.; Fryer, R. I.; Metlesics, W.; Reeder, E.; Sach, G.; Saucy, G.; Stempel, A. (1962). "Quinazolines and 1,4-Benzodiazepines. VI.1a Halo-, Methyl-, and Methoxy-substituted 1,3-Dihydro-5-phenyl-2H-1,4-benzodiazepin-2-ones1b,c". The Journal of Organic Chemistry 27 (11): 3788. ^ Chattaway, F. D. (1904). "XXXVIII. ?Intramolecular rearrangement in derivatives of the aromatic aminoketones". Journal of the Chemical Society, Transactions 85: 340. ^ "Glycine Ethyl Ester Hydrochloride". Organic Syntheses 14: 46. 1934. ^ Sternbach, L. H.; Reeder, E. (1961). "Quinazolines and 1,4-Benzodiazepines. IV.1,2 Transformations of 7-Chloro-2-methylamino-5-phenyl-3H-1,4-benzodiazepine 4-Oxide3". The Journal of Organic Chemistry 26 (12): 4936–4941. ^ Earl Reeder, Nutley and Leo Henryk Sternbach, U.S. Patent 3,109,843 (1963). ^ E. Reeder, L.H. Sternbach, U.S. Patent 3,371,085 (1968). ^ Gates, M. (1980). "New synthesis of diazepam". The Journal of Organic Chemistry 45 (9): 1675–1681. ^ Ishikura, M. .; Mori, M. .; Ikeda, T. .; Terashima, M. .; Ban, Y. . (1982). "New synthesis of diazepam and the related 1,4-benzodiazepines by means of palladium-catalyzed carbonylation". The Journal of Organic Chemistry 47 (12): 2456–2461. ^ a b Jones AW, Holmgren A, Kugelberg FC (April 2007). "Concentrations of scheduled prescription drugs in blood of impaired drivers: considerations for interpreting the results". Therapeutic Drug Monitoring 29 (2): 248–60. ^ Fraser AD, Bryan W (1991). "Evaluation of the Abbott ADx and TDx serum benzodiazepine immunoassays for analysis of alprazolam". Journal of Analytical Toxicology 15 (2): 63–5. ^ Baselt R (2011). Disposition of Toxic Drugs and Chemicals in Man (9th ed.). Seal Beach, CA: Biomedical Publications. pp. 471–473. ^ Marshall KP, Georgievskava Z, Georgievsky I (June 2009). "Social reactions to Valium and Prozac: a cultural lag perspective of drug diffusion and adoption". Research in Social & Administrative Pharmacy : RSAP 5 (2): 94–107. ^ Mant A, Whicker SD, McManus P, Birkett DJ, Edmonds D, Dumbrell D (December 1993). "Benzodiazepine utilisation in Australia: report from a new pharmacoepidemiological database". Australian Journal of Public Health 17 (4): 345–9. ^ Atack JR (May 2005). "The benzodiazepine binding site of GABA(A) receptors as a target for the development of novel anxiolytics". Expert Opinion on Investigational Drugs 14 (5): 601–18. ^ Dièye AM, Sylla M, Ndiaye A, Ndiaye M, Sy GY, Faye B (June 2006). "Benzodiazepines prescription in Dakar: a study about prescribing habits and knowledge in general practitioners, neurologists and psychiatrists". Fundamental & Clinical Pharmacology 20 (3): 235–8. ^ Yoshimura K, Horiuchi M, Inoue Y, Yamamoto K (January 1984). "[Pharmacological studies on drug dependence. (III): Intravenous self-administration of some CNS-affecting drugs and a new sleep-inducer, 1H-1, 2, 4-triazolyl benzophenone derivative (450191-S), in rats]". Nihon Yakurigaku Zasshi. Folia Pharmacologica Japonica 83 (1): 39–67. ^ Woolverton WL, Nader MA (December 1995). "Effects of several benzodiazepines, alone and in combination with flumazenil, in rhesus monkeys trained to discriminate pentobarbital from saline". Psychopharmacology 122 (3): 230–6. ^ Griffiths RR, Johnson MW (2005). "Relative abuse liability of hypnotic drugs: a conceptual framework and algorithm for differentiating among compounds". The Journal of Clinical Psychiatry. 66 Suppl 9: 31–41. ^ Bergman U, Dahl-Puustinen ML (1989). "Use of prescription forgeries in a drug abuse surveillance network". European Journal of Clinical Pharmacology 36 (6): 621–3. ^ Cosbey SH (December 1986). "Drugs and the impaired driver in Northern Ireland: an analytical survey". Forensic Science International 32 (4): 245–58. ^ Rahminiwati M, Nishimura M (April 1999). "Effects of delta 9-tetrahydrocannabinol and diazepam on feeding behavior in mice". The Journal of Veterinary Medical Science / the Japanese Society of Veterinary Science 61 (4): 351–5. The states of California and Florida offer diazepam to condemned inmates as a pre-execution sedative as part of their lethal injection program.